The heavy haulage industry in Portland is one of our largest employers with numerous companies and individual owner operators working in this sector. As you will notice on the roads leading to Portland the large numbers of trucks carrying freight. 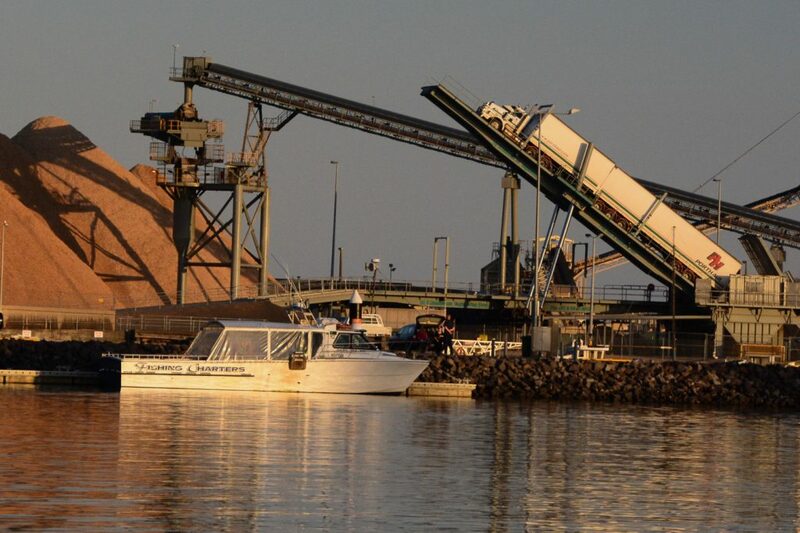 With Portland being home to the largest natural deep sea port in Victoria, and used principally for the export of logs, wood chip, aluminium ingots,livestock,grain and fertiliser. All thees commodities come in via road on heavy haulage. which operates 24 hours a day 7 days a week. Most heavy haulage vehicles operating in the region have specially designed trailers to carry one type of goods, eg logs or chips. The trawler wharf makes an excellent vantage point to watch the chip trucks unloading. Each truck only takes a few minutes as it tips nearly vertical to unload. Add to the log and chip trucks the trucks with general cargo, grain and aluminium ingots there is approximately one truck every 30 seconds entering the Port of Portland to unload export commodities 7 days a week.